"If you think maths is a hard subject you won't succeed," 10-year-old Hai Yang tells me. Along with some of the other pupils from Class 4D at Woodgrove Primary School, he's explaining the maths lesson I have just been watching. The whole class has just been working on a problem, taking it in turns to stand up and explain how they worked it out. And they do this in English, one of several languages spoken in Singapore. It turns out there is more than one way to reach the right solution. What is impressive is their commitment to understanding exactly how to do it. "If we just blindly look at the teacher's answer, when we grow up we might not know how to do it any more," says Megna. This is an approach known as maths mastery which some schools in the UK have begun using in an adapted form. It is just part of a success story which has led to global interest. Singapore benefits from being a small system, where all the teachers are centrally trained at the vast National Institute of Education. The Director, Professor Tan Oon Seng, told me they recruit teachers for their depth of subject knowledge and expect them to make sure each child grasps the building blocks. "We believe in Singapore in the fundamentals, that in order for a child to be well educated you need to give them the fundamental language and grammar in various disciplines, a language where you can read, a language where you can understand numbers. " 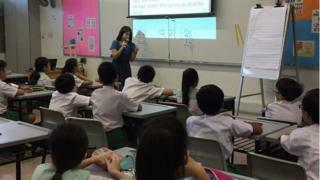 Singapore has also thought a lot about how to make teaching a rewarding profession. The status is relatively high because of the competition to get in. Teachers can follow a career path that takes them towards being a principal, a researcher into education or a master classroom teacher. They get time to deepen their knowledge and prepare lessons. At two secondary schools I saw attempts to inject more creativity into learning. In Montfort Secondary school they are encouraging the teenage boys to make prototype products, ranging from a smart garden watering system to an electronic keyboard. Using your science and maths skills to solve real world problems is exactly the kind of ability the PISA tests are intended to measure. An empty room at the school is being turned into what they call a "makers lab". Simple tools and materials will be available for the pupils to use in their spare time to make things to take home. If they want to work out how to light up their guitar with LED lights, this is where they can do it. "We want to make learning authentic for students. It's got to be related to the real world, so it helps their learning, not just in science but in many other areas," said teacher Ricky Tan Pee Loon. There is also an increasing emphasis on collaboration. Khoo Tse Horng, the principal at St Hilda's secondary school, says teachers are working differently too. When he started in teaching it was much more about being mentored by someone more experienced. "Today teachers work in teams, they grow together, they research together, they work together." But perhaps the most powerful collaborators in Singapore's success are its parents. The system is competitive, with a Primary School Leaving Exam that influences whether a child gets a place at their first choice school. Secondary school pupils are streamed into an academic "express" stream and what is described as the normal stream which is more likely to lead to a technical or vocational diploma. So one evening at 20:00 I watch children as young as four practising maths at one of the 3Gabacus centres. Lucas, who is six, is happily solving maths problems against the clock. His parents Eric and Nicole Chan tell me they bring their children for an hour of extra tuition to give them extra confidence. There is a downside, captured in a recent film by volunteers at a Singapore brand agency. It is about a girl who becomes depressed and stressed in the run up to her end of primary exam. Jerome Lau, one of the directors at Splash, says it was inspired by the experience of a friend. "If you start judging them and giving them a label it's a really unfair. Every child has the potential to do well." Singapore's system is changing partly due to a recognition that the stakes are high. So changes to the way scores are published and used to rank pupils are being introduced. This is a system which recognises some of its weaknesses but remains committed to being remaining among the best.